Valid Reason #1: Multiple positions. If I have three positions, all of which pay in entirely different pay scales but need the same skillsets, and you have those skillsets, I need to make sure I’m presenting you to the right role, and not wasting your time. 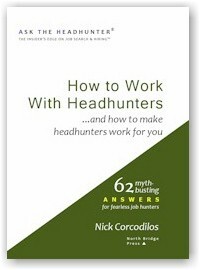 Valid Reason #2: Headhunters are agents. If your agent is going to be representing you, there is only one type that will do it without knowing all your information pertaining to a job: a lousy one. If I will be approaching other companies for you, I need that number in my head when I talk to other companies about your profile. Otherwise, I cannot weed out the roles that are not a fit for you in terms of compensation (after I’ve determined that they would be a fit based on role, responsibilities, goals, quotas, etc). I’m actually quite confused as to why candidates have a problem disclosing salary information to headhunters. It’s one thing if you’re talking to a company and you do that, because you will lose all leverage that way – but a headhunter is acting on your behalf, and in your best interests. S/he will take your numbers and use them as leverage for a position. Take this into consideration: You’re a marketing analyst working at a smaller firm, and you’d like to make a move to a larger organization. 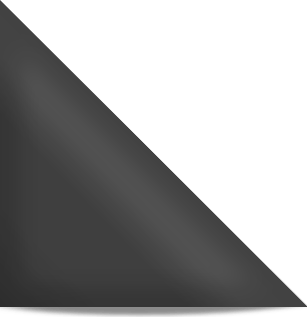 You get a call from a headhunter who happens to be representing a larger marketing firm. You: 10 years of experience, making $70,000. Them: Needing someone with 8 – 9 years of experience, offering $80,000. As a headhunter representing a company like that, I will ask you what your salary is and I will NOT tell you what the company is willing to pay – only that “you’re in the range”. I just made that woman’s month. Reason #2 is an outright BS! Headhunters work for companies, not candidates. So please stop this BS! Any headhunter who tells me they are working for me would never get a return call for me. Who pays you? Not candidate. If you are using deception in misrepresenting yourself, I have no reason to trust you are telling me truth at any given time. Apollo, while it is my job to find candidates for my clients 90% of the time, at the same time, I also engage in the reverse. This is another way a headhunter works – by taking a high-caliber candidate and approaching the companies that s/he would be interested in. Either way, it’s important whether I’m looking for a company for you, or trying to place you at an existing client of mine – I am working WITH this company, but I am representing YOU. I am standing behind you and assuring to this employer that this is the person that you want. How can I do that when I don’t even know what you’re making?? Jesse Hache, I’m going to have to call BS on your entire response. For reason #1, it is sufficient to know the applicant’s salary requirements. If the multiple jobs have widely differing payscales, there is something different about them. It might be in differing duties, different regions involving different costs of living. Whatever the reasons, knowing my salary may help you decide on a slot to file me in, but tells you nothing about whether I would be a good match to the job/employer. Apollo nailed the answer to reason #2. Unless I am paying you, you are not representing me. This strikes me about as smart as offering $150k on a house while telling the seller’s real estate agent that you’d be willing to go as high as $200k. You have essentially told me that you will tell your employer (the hiring company) my information, but will not make it a fair exchange by telling me the salary/budget they have in mind for the position. In other words, you will decide whether going through the entire interviewing process is a waste of my, and the company’s, time. You’ve also given as an example an unprofessional use of humor with the applicant. Unless that woman was a personal friend, I find the use of humor in a situation with a power differential to be inappropriate. The disappointment to relief cycle smells a little bit of a sales tactic to get the applicant to take less than she could have received. You have painted yourself as her agent, “getting” her something when, in fact, you are “getting” the company that pays you something — the most person for the fewest dollars possible. An employer or headhunter just need to know how much you are asking – not making. And that shouldn’t be revealed until well into the interview process. Your salary at your current or previous employers is confidential to everyone except the IRS. If they bully you can reveal but have a solid number in mind. Please save me the BS! I have been in this game called business long enough to know who works for who. My favorite headhunters call me when they have an opportunity that matches my capabilities or they want to see if I could send someone their way. Jesse, let us make the game more simple, you can ask me for my past salary, if you give me copies of your tax returns for your entire career. How else can I determine that you are decent headhunter? While we are at it, I want you to put aside money in escrow to defend me in case I am breaking NDAs by disclosing my info. So how would you like a taste of your own medicine? Do you see how fair that would be? 1. I am confident that you actually do have contract to recruit for the opportunity. I simply will not allow you to spam companies using my candidacy. There are too many bad recruiters out there and I have been on the receiving end of those hundreds of resumes too many times. 2. I am confident you gave me all the details on the position, company, culture, benefits. Without those details I can not give you a fair assessment what I feel the value I could bring to the organization. T one company I am worth my weight in gold, to another I may not be. I don’t hop between companies, hence I want to invest myself in companies who value me. abileneblues – “The disappointment to relief cycle smells a little bit of a sales tactic to get the applicant to take less than she could have received.” Why then, in my example, did Julie end up with more money? As a headhunter working on 100% commission, it is always in my best interest to get the candidate more money … for their happiness and for mine. I cannot think of a single reason why I would want one of my candidates to make LESS money … everyone loses, except for my clients balance sheet (which they had allocated for a higher range, anyway). Also abileneblues, as a smart and confident headhunter, to answer your third paragraph – yes, it isn’t a fair trade, for the most part. My job is to evaluate your skills for a position – this means being thorough. Only after all of the qualifications are aligned will I spend my time putting together a presentation with your resume. Once you’re given the company name, then I’ll send you a job description – but up until that point, I am evaluating you. Your info doesn’t go to a company unless there’s a fit. And the info that I take from you is also recorded and valuable for future positions, should another person in my organization come across your file in our CRM. Also, I think I may need to differentiate at this point in time, that I work in Canada – most of my candidates are here in Canada, and I would have to say that about 0.2% of them initially have a problem giving me their current base salary. If they do, I explain to them why it’s important that I know. Apollo, if your company has you under an NDA for your salary information, then that’s that. You should know what NDAs you are under and when you would be breaking them. Secondly, as I had mentioned earlier Apollo, I work by asking my best candidates what companies they have a lot of respect for, and then approaching those companies for them. I market them with their permission, without sending resumes right away. Once I get a signed agreement, then I can send their resume – only after I get the candidate’s permission. It’s a ground rule that resumes are never sent without the candidate’s permission, and unless there’s a signed agreement with the company. Doing otherwise on other points is simply a waste of time, and I don’t have time to waste on ‘spam’, which is exactly what that is. Jesse, I’m still not clear on how knowing the candidate’s salary history helps you. Why is that more useful to you than just knowing the candidate’s salary requirements? I think you’re the kind of headhunter who does right by candidates most of the time – you try to get them the best salary you can; you “market” them to other appropriate companies; you try to satisfy both your client and the headhunter, recognizing that while employers pay your bill, you need happy placements to refer other good candidates to you. 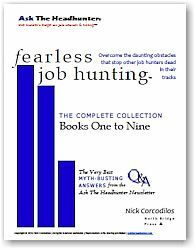 But I also think you’re falling prey to the stories headhunters learn to tell early in their careers. Some of these are just fundamentally untrue, and telling them gets a real rise out of smart people — like those who have responded to you here. Headhunters are not agents. They are employed strictly by employers. You do not represent any job hunter. Your fiduciary duty is to your client, the employer. If you behave like you respresent a candidate, you are violating that obligation. It’s simple: The employer pays you whether you’re working on an active assignment, or whether you had the idea to take a good candidate to a company that’s not looking. I’ve known headhunters like you. I was one of them as I was learning the business. We try to do the right thing for both client and candidate, and we start to believe we “represent” the candidate. We don’t. But here’s what I think distinguishes you from the rabble: You recognize that you have an obligation to your candidates, because you depend on them to refer other good candidates to you. Folks, please consider this. It’s a very motivating matter to a good headhunter. The last thing I’d ever do is compromise a candidate — even for a good client. That candidate holds in his hands my reputation in the community I recruit from. The headhunter still doesn’t represent you. But if he’s smart and honest, he tries to take care of you. Nonetheless, there’s a difference. Be aware of it. Jesse, I don’t mean to sound like your dutch uncle because that’s none of my business — but I encourage you to listen to the criticism. One half notch upwards and you’ll get a lot of respect from people who worry about who is a good headhunter and who is not. Just be straight with them. You’re not their agent. But you can still help them. Like I said, you can act in a candidate’s interests, but not on their behalf. You are beholden to someone else. In the end, you must first look out for your client. (I’ve fired clients because of the way they treated a candidate. But that’s a serious action that has ramifications.) The line can be straddled, but it’s still a line. Any smart candidate knows who you report to; don’t deny it. But it’s still possible to demonstrate sincere interest in doing what’s good for the candidate. To me, that starts with respecting good candidates who tell you they will not divulge their salary. Is it really worth dumping them? I think it’s worth going to the client and saying, Hey, here’s why you don’t need to know, and here’s how I’m gonna help you figure out what the candidate is worth anyway. That’s a long two bits worth of opinion, but this is an important discussion. I still don’t think a candidate is to be dumped because they won’t share salary. Your job (and mine, and the employer’s) is to figure out what a candidate is worth to THIS client NOW. Actually, let me clear something up that might be giving a bit of a misconception: Candidate salary HISTORY is not something that I care about. All I want to know are three things – what you’re currently making, what your target is for a move, and what your minimum acceptable salary is. This arms me with the negotiation power I need to work things smoothly with a client. Nick, thanks for clearing a few of those things up. You’re right in that I am early in my career with this, which is one reason why I follow blogs like yours in the first place, to gain experience from more experienced members of this community. On that note Nick, I believe you’re right. I will hold allegiance to the fact that as a headhunter, I find candidates for jobs; that is my number one priority. However, because of the thorough screening that I do when I acquire and present candidates, I tend to get tied to them more than any good headhunter ever will. That’s something I must learn not to do. With that said, I still don’t believe in not disclosing your salary to a recruiter. I DO, however, understand why some people don’t do it. A lot of recruiters aren’t trustworthy, and treat candidates like they’re fodder, easily expendable and replaceable. These recruiters will never make allies, only enemies. By nature I consider myself a headhunter with much more integrity, so maybe the lens through which I see the world is one where I have a hard time believing the reservations some candidates have. Sad, but true. The low cost of entry to the headhunting business encourages scalawags and fast-buck artists to join the ranks. They last about a year or so, destroy their reputations with employers, and tick off job hunters — who quickly trash them in the professional community. A good headhunter can be like a doctor or accountant. If you come to trust one, it’s best to tell them everything. They can put pieces together and see connections you won’t. 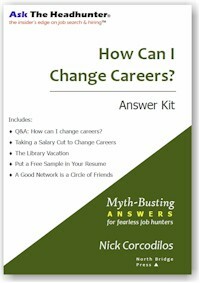 Now your challenge (as a job hunter) is to identify a headhunter you can trust. Share your contacts, and s/he will share insights that might help you out. Seriously. Why does it matter what someone is making now or in the past? If your resume has the required skills and experience, then you should be suitable for the job at the initial screening. i.e. what if someone negotiated poorly for their current position, or has been at a company for more than 5 years? We ALL know that being somewhere for a while lowers your “market” value as new hires come in making more. So, if pressured, one might give their current market value as their current salary, even if it’s not at the current market value. Everyone wants to get paid what they’re worth and companies want to pay as little as possible. That’s why it pays to know the going rate for jobs one way or the other. If you actually get the interview, this money discussion should be further into the process. Don’t waste peoples’ precious time. In my jobs where I have hired people, I never asked for salary history because I see no value in it at all. Lets face it, that’s like going out and writing up contracts based on what someone else did, what someone else did may have no relevance to my situation! I know what I can afford and I know what I need, then I find candidates that have what I need and can work for what I can afford. With a good performance review system in place that is open book and 360, you find out really quick who is worth what. With a turnover rate of less than 1%, I think our system works a hell of a lot better than anything else I’ve been subjected to over the years. As for HR, when I have been asked this, the entitlement attitude is just amazing. No you can’t have my past salary history, in fact that is my test for HR, if you ask, it shows me you don’t have it together. It says, you don’t know what you need in terms of skill set and what that really means to you in terms of benefits. If it all just dollars, that kind of thinking is what got us into this economic mess we are in, there is no value in repeating that. 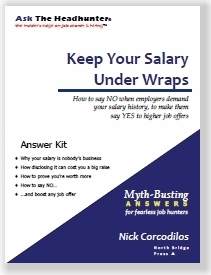 I advise people not to give a number when asked about “salary requirements” Salary history is another issue. I think it is usually best not to give it until the interview. You might explain, for example, that you believe that you are seriously underpaid and that therefore present salary is irrelevant. But at the interview it is is best to be honest and not to refuse to disclose it. The HR person in today’s column talks about a “right” to have this information. This is nonsense. The employer has no such right, but the employer does have the right to hire whoever he wants and not to hire someone who seems to have something to hide in an interview. – I believed stuff like that when I was younger, but the times when I did give my salary, why were all offers through those agents for exactly that amount? – You asked what incentive can you have for someone to be lower paid, when you are operating on commission — if you don’t make the sale, you don’t get any commission. I don’t remember where, but I read a good article on this scenario, about real estate agents. While they will makee the same claim that the higher the price, the higher the commission, the reality is that the marginal difference isn’t that big a deal compared to making the sale or making it sooner. What salary history are you requiring in order to do your work? I know I’m entering this discussion almost a year late, but a link to this post was sent to me, and as a jobseeker it’s very interesting to me. I used to live in a large metro area where the going rate for a position like I would be looking for is much greater than the smaller town I now live in. I was making the going rate in the larger metro area, now I’m faced with smaller salaries for a smaller, less expensive area. Basically, I’m forced to take a major pay-cut (by “major” I mean more than $10K) for a job very similar to what I was doing previously. So my big worry is what will happen if I accept a position with a lower salary because of the region I live in, eventually move to a larger metro area, and look for a job there? What kind of leverage does that give me if I divulge my salary history? What does that tell a headhunter in terms of my skillset and where I would “fit”? The truth is, we are in an economy where employers are paying less, and candidates are accepting less just so they can have a job and pay their bills. We’re stuck between a rock and a hard place. What do we, as jobseekers, do to make sure we’re paid fairly and not based on a last salary, without getting dumped by the headhunter or filed away by the hiring manager in the process for being “difficult”? Mr/s Hiring Manager: I’ll give you my salary history if you tell me yours, and also, what are the salaries of the last 3 people holding my position in your firm? This conversation is as fresh as it was last year…I am currently working with a headhunter (2 yrs. in the biz as I found out)that point blank asked me for my salary range and let me know the employer will want my salary history. Keeping in mind this was my initial conversation with him. I told him I was uncomfortable giving a range right now for two reasons: a. I do not know enough about this position b. This is typically a discussion that comes later in the interview process. As far as salary history, how ridiculous. I have been working contract around the country, all different ranges, bla, bla, bla (you know the story). I will have NO problem giving my salary history, if pressed, because I will lie! Oh yes I will! Painted in a corner and look what comes out! He also asked me for my references, again another thing that comes later in the interview process (in my experience). I do not want to give out contact information for my references, which I consider a precious relationship, unless there is a. an actual job description that I can send to them so they can be prepared to talk about my skills and how it relates to the position b. give them a heads up of when they will be called (these are busy people) c. know who will be calling them, is it the headhunter that will be calling them? the employer? certainly not both, I would expect. This person kept putting me on hold for periods of time talking with his manager. Hmmm, I guess he did not know how to handle my answers. Translation: I don’t kiss on the first date. Court me first and let’s see how we get along. Im a Finance professional , currently looking for a job and I know that WHEN an employer decides to hire there is ( SHOULD BE) some budget for the role. So, when I have an interview and get asked about my past salary I ask them instead” what is in a budget for the role” . Some do say, or give me a range. If the number(s) I hear I like – I usually respond ” the range you have for the role is working for me “. After that they usually do not have any questions. If they keep pushing for the number from me I keep saying the same all overand over again ” the range you have provided works just fine for me, so we are not wasting each others time”. they usually back off. I DO NOT WORK with those (employers, recruiters) who are trying to give me a pay that based solely on my previous pay. this is unfair and jsut rediculous.